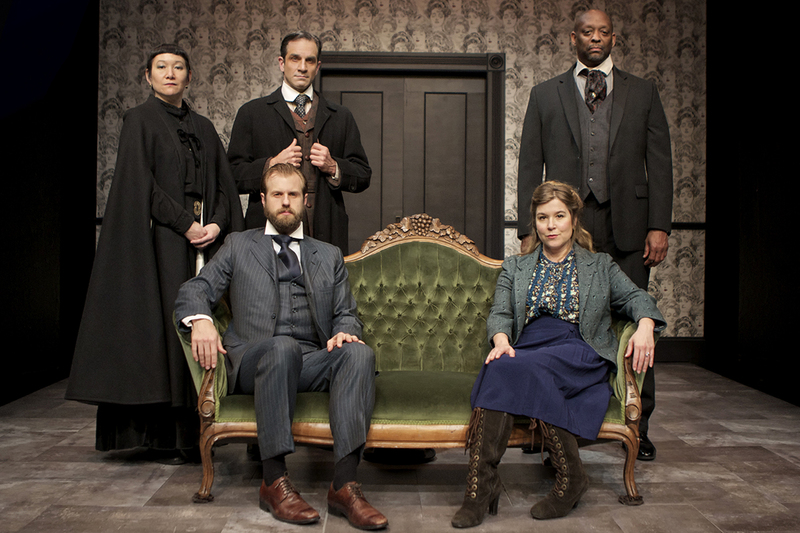 Clockwise from left: Erin Mei-Ling Stuart, Adam Elder, Michael J. Asberry, Jessma Evans, Kevin Kemp. Photo courtesy Pak Han. In 1879, shocked audiences watched Nora leave her husband to pursue an education at the end of the first production of Henrik Ibsen’s A Doll’s House. Since then, the play’s feminist themes and complex relationships have elevated it into the pantheon of modern dramatic masterpieces. But it’s not Ibsen’s version of A Doll’s House that Shotgun Players has chosen to start off their season – rather, it’s the theatrical adaptation by legendary film director Ingmar Bergman (The Seventh Seal). The adapted script, along with Shotgun’s fascinating artistic decisions, cut away the chaff from the original to create a lean, tense experience. Shotgun’s smartest move was not underestimating their audience; Nora is especially rich for theatregoers familiar with Ibsen’s original work. Although the basic story beats are the same, the production moves away from familial drama and into a character study of Nora herself, as she becomes increasingly pressured by a patriarchal society. Jessma Evans creates a nuanced view of the character: She takes lines that would normally indicate subservience and reinterprets them into strikes at the people who continually underestimate her. Evans’ acting is intentionally at odds with the other characters, a twenty-first-century woman stuck in a world with the masculine ideals of the nineteenth. The most unusual character in the play, besides Nora, is Michael J. Asberry as Dr. Rank. In the original work, Dr. Rank is a dour, hopeless character, doomed both to a one-way infatuation with Nora and a painful terminal illness. However, Asberry’s poise and charisma lend the fatalistic doctor the bearing of a king, as he towers over the others in stage presence as well as height. Dr. Rank’s philosophy and motivations run perpendicular to the dignity-focused society of the play, but Shotgun’s production, backed by Asberry’s performance, asks if perhaps he was closer to the truth than the others suspected. The other men of the play are not given such flattering treatment: Nora’s husband Torvald (Kevin Kemp) is a swaggering, condescending brute from his first line, and Krogstad (Adam Elder) is as much a villain as he was in the original text. 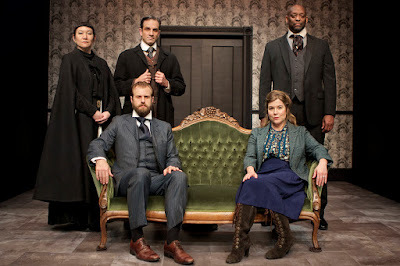 These interpretations reflect director Beth Wilmurt’s commentary on both Ibsen’s work and modern toxic masculinity, and would be heavy handed in a more character-focused version of the play. However, in this production, which takes a more introspective, symbolic view of Nora’s struggles, these characterizations smoothly fit the broader tone. Erin Mei-Ling Stuart periodically drifts onstage as Mrs. Linde, Nora’s wife and closest ally. Though her life is difficult, Mrs. Linde is hardened enough to bear it, and is able to help Nora through her journey without pushing her. Stuart’s interpretation feels more like a force of nature than a person – a comforting breeze when needed, and a thundercrack when called for. The technical work (Maya Linke as set designer, Allen Wilner as lighting designer, Matt Stines as sound designer) creates a sense of intense pressure as Nora’s marriage to Torvald becomes more and more unbearable. Dark ambient noise interrupts the usual theatre silence, never allowing the audience to relax; the bare, minimalistic set leaves no place for the eye to wander. However, the most interesting twist is the upstage wall, wallpapered with women’s faces and bearing a set of double doors that lead to Torvald’s office. The wall clearly delineates Torvald’s life from Nora’s, the man’s sphere from the woman’s, pushing slowly forward over the course of the show until only a few feet remain for the female characters to stand. It’s a brilliant work of nonverbal poetry that ties together the larger themes of the show. Nora at Shotgun Players explores new meaning in a text familiar to theatre veterans, yet still presents a coherent story for newcomers. The themes and characters from the original are adapted to fit a modern context and the director’s vision, but not so much to be unrecognizable. While the base text is a Swedish play written over a century ago, Nora – and innovative companies like Shotgun – represent the future of American theatre. Foothill Music Theatre: "Side Show"